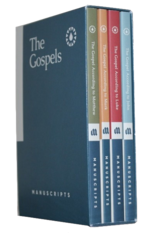 The Gospels are comprised of the books Matthew, Mark, Luke, & John in the Bible. They are the first four books in the New Testament. Did you know that The Gospel of Matthew was written for a Jewish audience and comes first in the New Testament because it acts as a natural bridge from the Old Testament? The Gospel of Mark was the first written account of Jesus' life. Luke, the physician, was the only author of the Bible who was not Jewish. While the first three gospels focus on the events of Jesus' life, the gospel of John centers on the meaning of thoses events. Download the pdf's below for more interesting facts & time lines related to the four gospels.